Non-linear plots are actually really a case of deluding your player. After all, you can have different gameplay experiences every game, but you can’t really make an infinite number of endings to a game. For a story intensive game, there must be some linearity to help tell the story. Some games favor letting you explore anything you want instead of forcing you onto a narrow path. Other games want to tell a complex story and narrow your options. 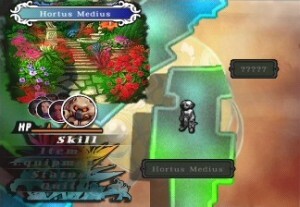 Unlimited Saga has a set number of missions to finish the plot for a character. 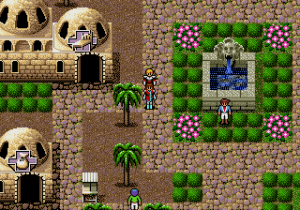 However, much of the game is spent on side missions so you can prepare for the plot missions. The most common example of a linear plot element is the “but thou must” questions. This might be something like “It’s time to report back to the base,” and being blocked from doing anything other than that. This might be a simple “Are you going to fight the dragon?” If you refuse to play along with the plot-line, the game may end, may block you from exploration, or may just repeat the question endlessly. The start of Eternal Legend has the player doing a couple of fetch quests so they can advance the plot. Another linear plot element is plot flags. This can be things like “the guards won’t let you through until you talk to the king.” This means you tend to get rather artificial plots where your characters stop saving the world in favor of looking for soap. Plot flags allow the world to change. Once the game knows, say, that you’ve seen the king, you can have dialogue change to reflect it. Plot flags are usually used to do plot recaps. So, for example, you can start a game, and it repeats your present goal and your last few actions. If you miss a plot flag, on the other hand, the game can stagger to a stop. SaGa Frontier has areas that trap you in specific areas until you finish the plot thread. You can also trap Lute in his final dungeon a few seconds into his game by picking the wrong options. A final element would be roadblocks or dead areas. This might be areas of the map that are shut off, or areas that simply don’t change as the game goes on. Of course, by closing off parts of the map, the game can cut down on disk swapping, or avoid having to change areas as the game world changes. By locking off early quests, the game encourages replaying the game to try other plot options. So let’s talk about negative results of these three elements. If the game doesn’t make you want to play along with the plot, a “but thou must” area of the game can be irritating. In Dragon Quest IX, you find several areas in the game that force you to do certain things to advance the plot instead of letting you explore. Chrono Cross is unusual since it actually provides an entirely different plot line if you refuse to help save a poisoned party member. If you assumed that you absolutely had to play along with the plot, you’d never know that you could try the other plot-line. You can ask questions in Piata in Phantasy Star IV as part of your investigation, but the game doesn't force you to do this. Plot flags are particularly annoying in early games. When you don’t have the text to point the player toward the required actions, you can easily get lost in a game. I actually find clues to advance the plot (go north to find the town of Teigue) to be much less annoying than being forced to talk to, say, the mayor to be able to find anything interesting in Teigue. I think this is because you’re not punished for knowing where to go next. 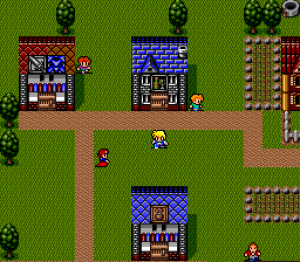 In Secret of the Stars, almost all towns use the "destroyed town" sprites late in the game. 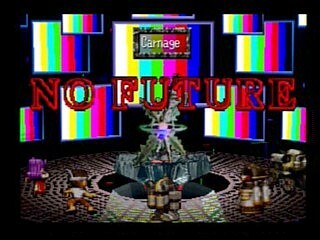 This means you can get very sick of the sprites and depressing music. Roadblocks can irritate players, but they can also be honest mistakes on the part of the game designers. For example, you are blocked from finding two things for 100% completion in Nostalgia. One of these is a rare monster in a specific dungeon, and the others are some chests that get lost when you finish the dungeon. Even if the game gives you fair warning that you can’t access certain areas, it can still be annoying that you can’t finish a quest, or just annoying that you can’t play around in the town with the pretty waterfall. Dead areas can be annoying when you are lost and looking for details to help with something. On the other hand, changing everything to destroyed towns can make the game world very boring. I think, in the end, a linear plot hangs on how it allows the player to do what they want. Obviously a game can hinder the player for the sake of plot or for logistical reasons. However, if you exhaust the player’s patience, then the player will just be annoyed. If the game only lets you do a side quest between getting a boat and getting on it, then the game is making it too annoying to try to see elements of the game. Of course, the quest may not be that important, but the player can be annoyed by losing the chance to see what’s going on. If the game makes the sequence to progress difficult to find, the player will be annoyed trying to guess what to do. On the other hand, if the game forces you to go from A to B, the player can be equally annoyed that they can’t do C which they know is the next important step. And Lute’s quest getting you stuck once made my friend bite his controller XD; He never threw it but if he was really hacked off – yeah. The one I hated in SaGa Frontier was the ship flight that ends up with you having to fight through a monster and a giant slime at the end. Slimes are a pain to fight to start with, and you can hit that sequence really early in the game. I think those games tend to start out linear so people can get their toes in the water and get used to the mechanics. FF7’s pretty linear at first too – until you get out of Midgar you’re on rails. (Ain’t no gettin’ off this train we’re on.) FF4, from what I’ve seen, did that too. it’s a tutorial tactic, and FF games are usually pretty good at making it work. It’s funny, because Chrono Trigger gives you a sidequestsplosion near the end too, but it doesn’t feel as chaotic as FF6’s WoR. Secret of Mana is – well, it alternates between ‘pretty linear’ and ‘linear with a lot of wiggle room’. You have a choice of which partner to pick up first and when, some of the towns don’t necessarily have to be visited on order – sometimes you have to go to X to get to Y but…I dunno, SoM doesn’t bother me so much with linearity. I think it’s because of the “Fate is steering your trike, son” kind of feel. You’re caught up in something huge by mistake and kind of borne along in the current WTFing all the way. I think Asellus gets hit by the squid quest and the slime one easily? I think Red does too. The squid never bothered me as much because the treasure’s better, and the map never felt as huge. FF6 does have vauge clues? You find Sabin pretty fast, and then I think the next town is Edgar and the disturbing castle full of sandworms. I think next you move the castle and find Setzer in the bar? And he sends you to get the airship. After that, the game opens up. I think you can get the birds carrying Cyan’s letters somewhere in there, and you can get Cyan. And then there’s Realm’s cave. (I think you’re forced to go through it?) After that, the game gets open. Due to spoilers, I tend to do Terra (for the handy early boss fight), Stratgo (because he’s easy with Realm along,) Gau, Mog and Umaru, and then the Phoenix cave. Shadow I usually left for a little later because I needed to get someone strong enough to get him from the arena. The Shadow stuff was just silly, since if you didn’t know the right dagger, you got stuck having your overpowered Sabin or Celes bash Chupon on the head endlessly. The games I find weirdest for breaking mimesis are ones with quest structures. Things where the world changes heavily to fit the structure of the quest and then changes back. It’s easy enough to go through the steps, and can make nice setpieces, but all I’m doing is staring at the sudden stuff that appeared.